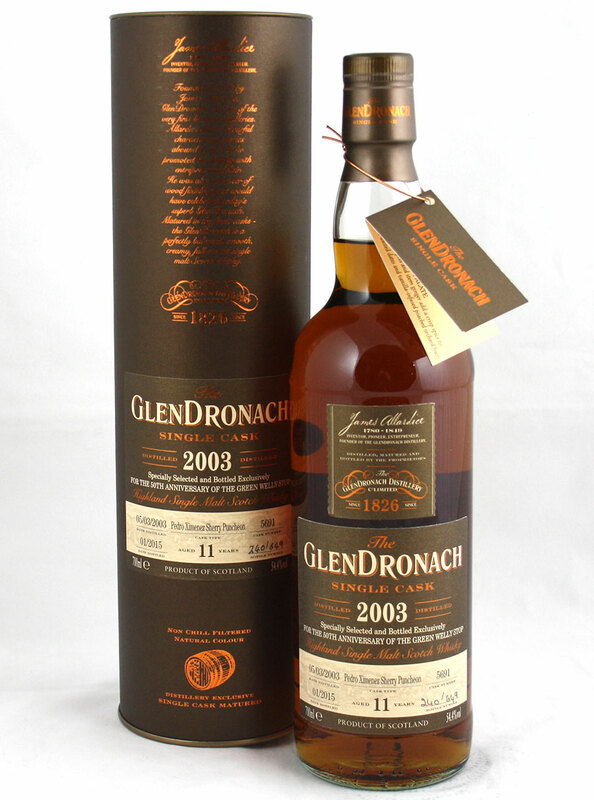 Distilled at the GlenDronach distillery 05/03/2003 and matured for 11 years in a Pedro Ximenez Sherry Puncheon cask No. 5691 before being bottled 01/2015 at 54.4% producing 649 bottles – specially selected and bottled exclusively for the 50th anniversary of The Green Welly Stop. Zip forward 49 years, on a cold night, the 28th September 2014, Six of us sat around a table in Tyndrum, and chose our initial 50th Anniversary Release. 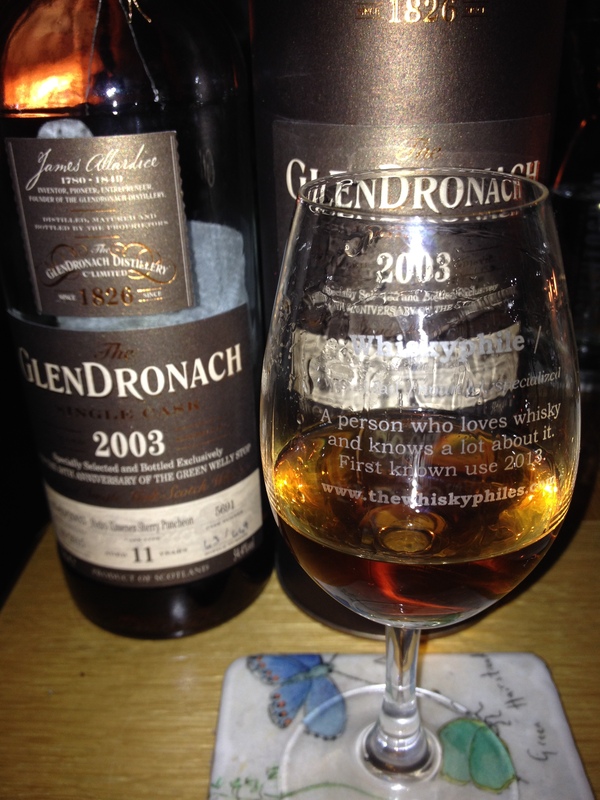 GlenDronach 2003, a smidgeon under 12 Years. Distilled 5th March 2003 and bottled January 2015. We had the choice between a PX and an Oloroso, and the PX won hands down. Bottles available: 649 – confirmed. Nose: White pepper and hints of ginger warm rich fig-syrup over sticky toffee pudding. No excuse is needed to purchase or sample a single cask GlenDronach these days, however when the Green Welly announced they were bottling something to celebrate their 50th anniversary you knew it was going to be good. Selected to keep the price under £50 and also to be a very drinkable and enjoyable whisky, they picked out this 11yo PX puncheon matured GlenDronach from 2003. Newly sharpened colour pencils (pencil shavings and crayon wax), fruity, figs, dates, raisin, white pepper, cinnamon, leather-bound journals, perfumed violets, brazil nuts and zesty lemon drizzle icing. Worth every penny! The best bang/buck whisky we have sampled so far this year – and don’t let the fact it is only February detract from that. A classic PX matured ‘Dronach. Oodles of fruit and nut but some fresher woody and spirit notes add zing and interest. Happy 50th at the green Welly Stop! A great dram from a great distillery and we are very glad you enjoyed it!